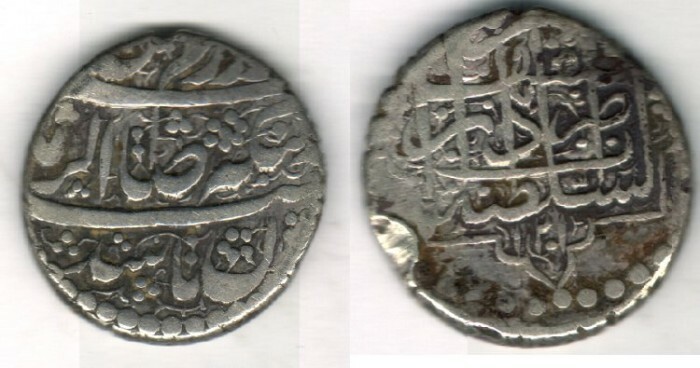 AH 1201 (AD1787) , clearly dated but KM states that the date is in error for 1210! Mint�name & date are in a decorated pattern inside a dotted circle. In Farsi reads: �Shod Afta�b-O-Ma�h,zar-O-sim dar Jahan/azsekkee-ye Emam be-haqq Sahib-oz-Zamman�, meaning; �theSun & the Moon became gold and silver/from the rightful Imam (the 12th Shi�aleader) the owner of the time�. Agha Muḥammad Khān Qājār (1742�1797) (Persian: آغا محمد خان قاجار)‎‎ was the chief of the Qajar tribe, succeeding his father Mohammad Hassan Khan, who was killed on the orders of Adil Shah. He became the Emperor/Shah of Persia in 1794 and established the Qajar dynasty. He was succeeded by his nephew, Fat′h Ali Shah Qajar.